The Alele Public Library is located on the second floor of the Alele building. We have a wide range of books available for borrowing and a reference collection which is for use only within the library. Adults (over 18) and Students of the College of the Marshall Islands : $2.5. You can arrange to renew the book you borrowed at the library or by telephone for an additional 14-day period provided the book is not in demand. Any lost or damaged items will be charged for at the discretion of the Librarian. 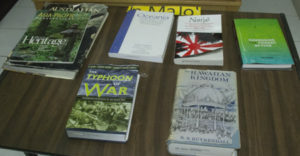 The library maintains the Pacific Collection room – a range of published and unpublished material specific to the Marshall Islands and Oceania, which is available for researchers, for on-site reading only. This collection is not available for borrowing. Alele carries a range of books for sale. 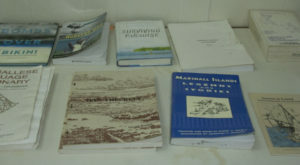 Subject materials is specific to the Marshall Islands and the region. The library offers photocopy service, with discounted price for members.